Two brothers contend for supremacy during the fall of the Qin Dynasty in Imperial China. Liu Bang and Xiang Yu, became leaders of a rebellious army, and also became sworn brothers in battle. King Huai states that whoever can subvert the Qin kingdom will be the Lord Qin, in order to benefit from the competition between Xiang Yu and Liu Bang. But who will emerge as the winner from this epic battle and survive to claim their path to the crown? Written and directed by Daniel Lee (14 Blades, Three Kingdoms), White Vengeance stars newcomer Shaofeng Feng, Leon Lai (Seven Swords, An Empress and the Warriors) and Hanyu Zhang (Bodyguards and Assassins), and BeyondHollywood.com called it "one of Daniel Lee's best films and one of the better Chinese period epics of late." Let's hope so. 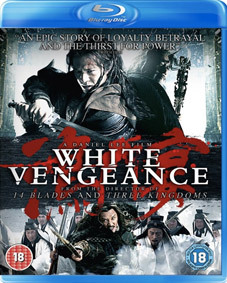 White Vengeance will be released on UK DVD and Blu-ray on 20th August 2012 by G2 Pictures at the RRP of £15.99 for the DVD and £19.99 for the Blu-ray. In common with all the discs whose release we're reporting today, we've no news on any extra features, but at least we've managed to track down a trailer for this one.